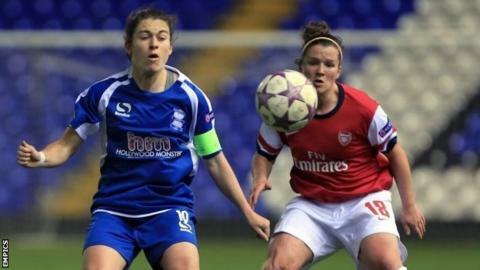 Birmingham captain Karen Carney feels her side can progress in the Women's Champions League despite being underdogs for their semi-final. The Blues will take on Swedish team Tyreso - who are tipped to win the trophy - in the first leg at Solihull on Saturday. But Birmingham reached the last four with a 3-0 aggregate win over 2007 European champions Arsenal. "People write us off at their peril," said Carney. "They did it when we played Arsenal and they're doing it again now, but I've got so much belief in this team," added the 26-year-old England winger, one of the oldest members of a side whose average age is just 20 years and 10 months. Carney was a member of the Arsenal team that won the tournament seven years ago by beating Swedish side Umea 1-0 on aggregate. She added: "The situation is a bit like the one I was in with Arsenal when they won the final against Umea. "They had won the competition twice, they were packed with big-name players and it was Arsenal's first final. "We won ugly, not with Arsenal's usual passing style, but we did what we had to to get our hands on the trophy and that's what the Blues have to do now." While Carney is Birmingham's only major international, Tyreso have a highly experienced multi-national outfit. Their biggest name is Brazil's Marta, five-times World Player of the Year and reportedly paid nearly £250,000 a season. Perhaps partly because of that, the Swedes have had off-field financial problems, almost slipping into bankruptcy at one point. But they have swept into the Champions League's last four and are expected by most pundits to beat Birmingham. They suffered a surprise Swedish League defeat to Kristianstadd on Sunday, but that was with Marta and captain Caroline Seger rested. There was no rest for any Birmingham players three days later, when they drew 0-0 with Everton in their opening Super League fixture. As they prepare for the biggest match in Birmingham's 46-year history, Carney said: "Lack of experience won't be a problem. "The kids are like I was when I got to the final with Arsenal. I was 18 and had no fear, and they're the same - they're not a bit scared."